I am thankful to be home, but want to say that the St. Emmelia Conference was truly a blessing, for so many reasons. I was hesitant to go, such a long distance, 5 days away from home and my younger ones (and husband :), was it really going to be worth it? That question was answered on the first evening of the conference. Thursday night after dinner and a few "get to know everyone" games, we all gathered to pray an Akathist. 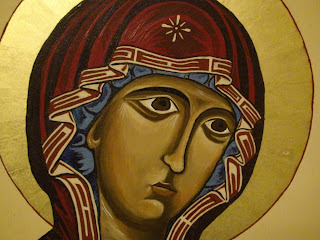 It is one of my favorites, The Akathist to the Mother of God, Nurturer of Children. We are blessed here at our parish to have a priest who gathers with mothers on a monthly basis to say these prayers, and I love attending. After several weeks of ups and downs, and the usual February homeschool burnout, I have been struggling with the ever present nagging doubts every homeschool parent must battle. Am I doing enough? Am I failing my children? Are they learning enough Latin, Math, History, etc? As we prayed the Akathist, one line jumped from the page, "Raise my children to be the least of all, that they may be great before God." After the prayers were complete, Bishop THOMAS took a moment to address us. His words were the thing I needed, a reminder to me of that "one thing needful". His gentle reprimand: whether our children are in private, public or homeschool, there is one true focus. I do not homeschool so that my children are better than others. I do not homeschool to create academic geniuses. I do not homeschool so they can attain great heights in this world. I homeschool that they might attain the kingdom of heaven, and become heirs of eternal blessings. I want them to learn, but for what purpose? That they may "strongly oppose atheists," that they may be delivered "from association with falsely-theorizing orators, who speak lies about Thine all-powerful intercession, " that they may "stand firmly against God-hating teaching." I do not pray for fame, for attention from this world, for academic acclaim. I want them to learn to think clearly. I want them to learn truth and beauty. I want them to see God in all. So while I continue to do the very best to instruct them, I must constantly remind myself that the race is not for achievement in this world, but rather for the attainment of the next. Oh thank you those are inspiring words indeed. Those quotes from the Akathist spoke to my heart. I'm so glad you got to go and thanks for the reminder of our importance as parents. I think your post is lovely, and the akathist you linked to made me cry ... until I got to the end and laughed: "...receive the Mister of Holy Baptism." I'm going to add the idea of gathering mothers to pray for their children to our list of things we'd like to do in a parish. oops, did not check for spelling errors Magda :) I will say, it has been such a blessing to have these prayers available at our parish. Often there are only 2 or 3 of us, but to be able to gather and say those prayers for our children monthly, it has been a true blessing to me personally. I am grateful to have a priest willing to add one more service to his many! This is a wonderful post. The things that you have said are the same reasons that I would like to homeschool. I want my children to know what we believe and why we believe it. And I also want them understand opposing views and be able to stand up for what they believe. I love that akatist as well.